Da Vinci - The Last Supper Stained Glass Artwork is a beautiful stained glass art that would make a wonderful addition to any home décor. For the last two millennia, the Last Supper has inspired people to live by faith in Jesus Christ, and to serve others instead of following the worldly influences of expecting to be served. 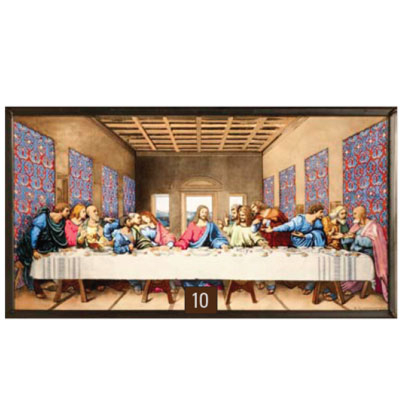 As one of the world’s best-loved religious images, many adaptations of the Leonardo Da Vinci painting exist and many have been interpreted in a variety of art media. Glassmasters stained glass tableau presentation has evoked emotions and acclaim by many theological leaders, museum curators and art collectors. Thanks to master artist, Carol Hicks, the tableau reveals a dynamic three dimensional illusion of the spiritual scene that draws the viewer in for a closer and mesmerizing experience. This beautiful stained glass panel measures 15.25" x 8.25".